Beginning of the month... new month, new possibilities, and time to recount the stats of the previous. Google just released the latest data on who out there with an Android device is running which version; which means for me to go and update our Platform Distribution History database. So, how are things out there? I know we've started to see the beginning of the rollout of flagship Lollipop updates, but are those numbers quite reflected yet? Well, early days still. The G3 just got it, and Samsung models haven't received it yet, so it's still sitting at a tinier 3.3%. (click past the jump to see some cool graphs I made! 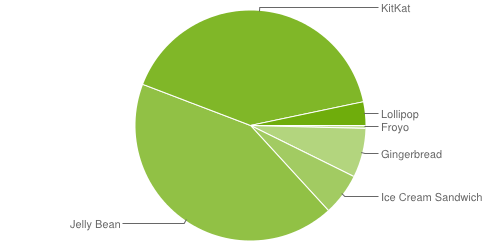 That may not seem like a lot, just 3.3% (just 1 out of every 30 people), but when you think about it, that's a lot of Nexus, or custom ROMs out there. It's a little hard to see with this chart (Google Drive still needs to be able to match Excel for chart work), so I did a little magic and compared each month at the starting point. To me, I see some quicker growth by the little nub that is Lollipop. Sure enough KitKat had some hockey-stick growth, let's see if L does the same.